Wisconsin’s Comprehensive Planning Legislation ensured that by 2010, every city, village, county and most towns in the state would be guided by a comprehensive plan as defined by state statute. Why the Smart Growth Comprehensive Planning Law was needed? As of 1998, only 29% of all Wisconsin communities had any kind of land use plan in place at all. The plans that did exist varied widely in their content, quality and age. Some communities had detailed plans covering a wide range of issues that were frequently updated. Other communities had poorly conceived or old plans. Even those communities with good plans often did not invest the time and resources to implement those plans when actual land use decisions were being made. The state offered little guidance on how to improve this situation. Less than 20 years ago, Wisconsin had no statewide plan for land use and we were all paying the price. -We lost nearly 4 million acres of farmland (that’s larger than the entire state of Connecticut). -We added over 10,000 miles of roads and more than doubled the miles we drive each year (almost 60 billion miles annually in Wisconsin). -Our land area in southeastern Wisconsin expanded 17 times faster than the rate of population growth. -In northern Wisconsin, undeveloped lakes became endangered -since the 1960s, about 60% of previously undeveloped lakes 10 acres and larger have been developed with one or more dwellings. -Development pressure on the larger lakes increased by 800% over the same time period. According to a study conducted by the Wisconsin Department of Natural Resources, unless we change our development patterns, all currently undeveloped lakes over ten acres will be developed by 2025. -In 1970, most people had never heard of forest fragmentation. Today it is one of the biggest threats to our northern boreal ecosystem. Forest fragmentation is disrupting the natural ecology of wooded areas throughout our northern forests. By 1990, the land of Leopold, Nelson and Muir was slowly losing its identity, seemingly destined to become a sprawling suburb sandwiched between Chicago and Minneapolis. In spite of all of these threats to our land, the state had no plans for managing growth. Nor did it have any organization trying to promote a rational strategy to address growth. Things started to change in 1996. A group of activists, frustrated by inaction at the state level, were determined to direct growth in ways that benefited the state and individual communities. This group eventually created an organization, called it 1000 Friends of Wisconsin and went to work. And in three short years, that small group had made a huge difference. By working collaboratively with municipalities, counties, builders and realtors, 1000 Friends was able to spearhead the successful effort to pass Wisconsin’s Comprehensive Planning Law in 1999. From the very start, the program had strong bi-partisan support. Starting with Republican Governor Tommy Thompson who worked with legislators to create the Smart Growth law, Democratic Governor Jim Doyle rescued the program from a repeal of the law contained in the 2005-07 state budget, which was orchestrated by a small group of legislators who misrepresented how the law worked. Communities across the state would be required to enlist their residents in an open, comprehensive planning process that would lead to informed choices about where and when future growth would take place. The planning would be open and comprehensive. Plans would have to address land use impacts related to transportation choices, housing, utilities, economic development, agriculture and intergovernmental concerns. Gone were the days of “developer’s choice.” Decisions about development would take place openly and with public participation. Land use decisions would be made in a larger context. There are a total of 1,923 local governments in Wisconsin. The law required 1,242 communities to develop comprehensive plans by 2010. Currently, over 1,500 have adopted final plans. That means many of the local governments are choosing to do comprehensive planning. That represents a very good record of compliance for a new way of doing business in the state. Until 2010, the plans were advisory. Now, all land use decisions in communities that are required to have plans must be consistent with those plans. That means that the vision that was created through the comprehensive planning process has a meaning that no other plans have had. Instead of gathering dust on a shelf, comprehensive plans are dynamic documents that will guide land use decisions in a community. The plan represents a vision and the actions of a community will have to make that image a reality. If a land use decision is not consistent with the plan, either the land use decision is not allowed – or the plan must be amended. That amendment must allow citizen input, ensuring public participation in changes to the plan. The comprehensive plan is meant to be dynamic – changing with changing times, changing economics and changing demographics. 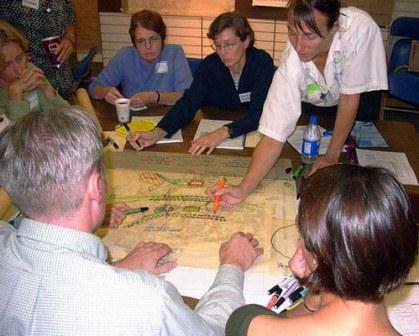 While communities are encouraged to revisit their plans as needed, all communities are required to update their plans at least once every ten years. All land use decisions carry a certain amount of controversy. We have had to fight repeal efforts almost every session of the legislature. But, for the first time in the state’s history, comprehensive planning with public participation is the law. It may be the state’s best chance to hold on to the legacy of Gaylord Nelson, John Muir and Aldo Leopold. 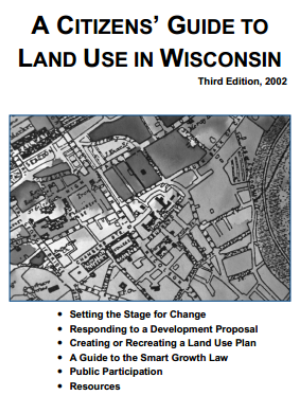 Read the Citizen’s Guide to Land Use in Wisconsin.